Mass Cryp Review: Blockchain based decentralized advertising platform? Mass Cryp provide no information on their website about who owns or runs the business. The Mass Cryp website domain (“masscryp.com”) was privately registered on August 27th, 2017. Why they’re not identified on the main Mass Cryp website I have no idea, but a Mass Cryp token website identifies Pijush Sarkar (CEO), Saurabh Singh (CFO) and Shashank Mishra (COO) as co-founders of the company. an Entrepreneur, Blockchain and Cryptocurrency awareness trainer. 12 years of experience in business development and designing business road maps for different companies. Saurabh Singh is ‘an Entrepreneur, Cryptocurrency mining awareness trainer with 8+ years experience in IT sector‘. an Entrepreneur with 8+ years in administration management in different sectors. He has extensive experience in investing in property and Real estate business. Attempts to verify the provided history or any of Mass Crypt’s co-founders turned up nothing. I’m flagging this as highly suspicious. Alexa traffic estimates for both the Mass Cryp main and token websites reveal India is the top source of traffic (73% and 35% respectively). This strongly suggests and Mass Cryp is being operated out of India itself. Mass Cryp has no retailable products or services, with affiliates only able to market Mass Cryp affiliate membership itself. Mass Cryp affiliates invest $100 worth of bitcoin on the promise of a “$120 guaranteed return”. Mass Cryp cap payable unilevel levels at fifteen, with referral commissions paid out as a percentage of bitcoin invested across these fifteen levels. Mass Cryp also offer something called “Turnover Sharing”, through which they claim affiliates can “convert your $100 to $9420. 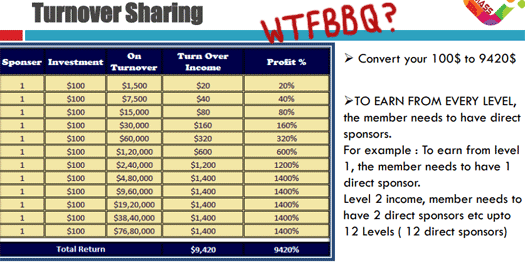 In any event I’ve included the Turnover Sharing explanation from the Mass Cryp compensation plan above for reference. Mass Cryp affiliate investment is tied to a minimum $100 investment in bitcoin. MASS CRYP Enterprise is a brand and project manager that follows a transformation management process geared towards innovation in order to create fast solutions tailored to the needs of the market. What does any of that mean? Who knows, but it has nothing to do with Mass Cryp’s MLM opportunity. 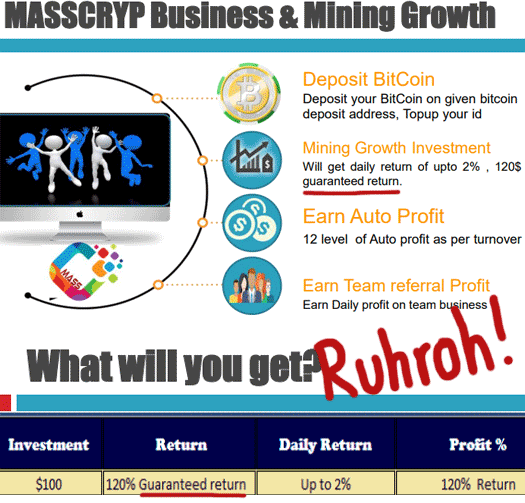 Mass Cryp offer up a simple $100 in $120 out Ponzi scheme. The company goes to great lengths to hide this, with no information about the MLM side of the business provided on either the main or token websites. As far as I can tell the MASS ICO is just smoke and mirrors. After launching at 10 cents, Mass Cryp boast the value of MASS “touched 0.21$ just in 12 days”. 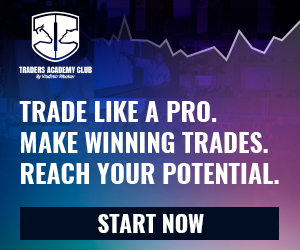 MASS is a non publicly tradeable cryptocurrency which Mass Cryp is flogging off to affiliate investors. Of note is the US being the second largest source of traffic to both the Mass Cryp main and token websites. I ran a search for “mass cryp” on the SEC’s Edgar database and turned up nothing. This is important because, as above, Mass Cryp is an investment opportunity and is being marketed as such. Getting back to the company’s MLM opportunity, the only verifiable source of revenue entering Mass Crypt is new affiliate investment. Both by way of MASS token investment and individual $100 bitcoin investments. The use of newly invested funds to pay existing investors a $120 ROI makes Mass Cryp a Ponzi scheme. As with all Ponzi schemes, once affiliate recruitment dries up so too will funds entering the scheme. This will starve Mass Cryp of ROI revenue, eventually prompting a collapse. By this stage MASS’s internal value will have also collapsed (no way to convert MASS to real money). The math behind a Ponzi scheme’s collapse guarantees that the majority of investors will lose money.